Smear Away. Liquid cleaner for sensor. Specially formulated to protect your sensor as it cleans away oil and lubricant, Smear Away™ also provides an anti-static barrier to reduce further contamination. 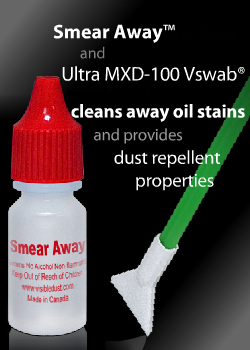 It is recommended to use Smear Away™ with VisibleDust MXD-100 (green) Sensor Swabs. on ITO and non ITO coated sensors. FREE SHIPPING from AMAZON for Canada and USA.